Alienware is one of the biggest manufacturers of gaming laptops and has gone from strength to strength since its acquisition by Dell. The M11x is the smallest laptop in the company's range and has just been updated with a powerful new Intel Sandy Bridge processor for playing the latest titles. With their sharp edges and glowing lights, Alienware laptops look very distinctive. We personally like the futuristic design, which gives the M11x the appearance of a miniature alien craft, but it won't suit all tastes. Most gaming laptops are hefty beasts, but this one weighs just 2kg and the solid chassis measures just 32mm at its thickest point. It's still a tough build, with a thick rubberised lid and tough hinges. If you need a portable gaming machine to take around a friend's house or keep you entertained on trips, this really is a fantastic option. In order to keep the chassis slender, Alienware has unfortunately left out a DVD drive. If you want to install games from a physical disc, you'll need to attach an external drive, or else you can download games from the internet, using services such as Steam. However, the 250GB hard drive offers limited space, especially if you plan on carrying music and films on the laptop as well as games. While the previous M11x had an Intel Core 2 Duo processor, which would struggle to run some of today's demanding games, this update features Intel's latest Sandy Bridge technology. We were impressed by the high frame rates when playing resource-crushing action and driving games, although the internal fans do get loud at times. Still, you can always drown that out with the sound of gunfire. Games also look amazing, with the Nvidia GT 540M graphics card coping admirably even on high detail levels. The graphics card deactivates automatically when you don't need it to preserve battery life. We managed two hours of blasting action on battery power, which increased to just over four hours when watching video or running basic applications. The 11.6-inch display is rather compact for a gaming machine, but the sharp 1366 x 768-pixel resolution makes it a moot point. Images are crisp, clear and colourful, and you'll be blown away playing games such as Crysis 2. 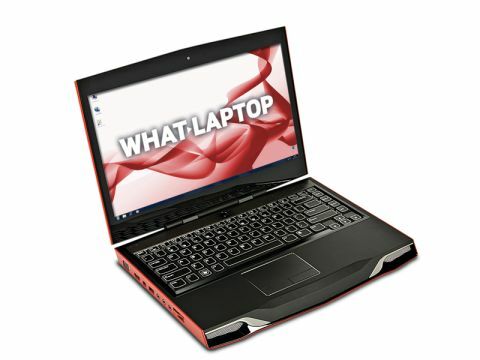 Usability is another important aspect of any gaming laptop. The keyboard is understandably condensed, but makes the most of its limited space, and a soft blue backlight illuminates each key for late-night sessions. However, those with chunky fingers might struggle, especially with strategy titles and other games using lots of keyboard commands. There's a surprising range of ports packed into the compact chassis, including a mini-Firewire connection, three USB ports featuring Sleep and Charge technology, and DisplayPort and HDMI ports for attaching external monitors. A 4-in-1 memory card reader can be used to grab your media straight from portable devices. If you're serious about gaming and need an entertainment machine to take on the road whenever you want, the Alienware M11x is a great solution. With Sandy Bridge performance, a sharp screen and surprising portability, there's lots to like about this tiny powerhouse.